South East Makers Club returns for a third year during the London Design Festival this September. This time we've moved to the beginning of the Festival and are concentrating our effort in Deptford with a series of making and design events that will be clustered around the carriage ramp in the Deptford Market Yard and nearby spaces. South East Makers Club shines a spotlight on the diverse creative talent of people living and working in South East London. We have an engaging and exciting line up of events including an immersive installation, exhibitions, a local design themed supper club, the Makers Market, the Workshop Room, a sketching tour of the area and the Designer Pub Quiz. Read about all our scheduled events below. South East Makers Club presents Byplace, an immersive installation by Deptford-based design company Giles Miller Studio and fabricators Aldworth James & Bond. Celebrating the marriage between design and making the large-scale sculptural structure plays on density and perspective, drawing on Giles Miller Studio’s award-winning aesthetic. The project is supported by Deptford Market Yard, structural engineering specialists Shockledge and material sponsors DHH Timber. Peckham based design studio Unit Lab are taking up temporary residence on the Carriage Ramp and will present a playful show of their new collection. They’re excited by science and marry their infectious curiosity with engineering know-how and design-aesthetic to create products that tickle people’s imagination. Makers House was founded in 2017 as a roving, design-led and highly curated gallery and shop. The aim; to bring together a group of designers and makers seeking an alternative to traditional exhibiting methods. This year, the art of collaboration is at the heart of the exhibit, Makers House is showcasing partnerships from some of South London’s most exciting up-and- coming makers. Some of these collaborations are the result of exhibiting together at previous Makers House shows, others from long-standing artistic alliances and the exploration of these varied creative relationships will be central to this years exhibition. Storytelling is an essential part of Makers House, showcasing the entire making process from initial sketches via months of experimentation to a finished product. This is an increasingly prominent and important story for consumers in a progressively more conscious marketplace. Makers House breaks down the barriers of traditional design showcases, enabling new conversations and ideas to evolve between makers and visitors. iya studio / iyouall will be launching their new range of design notebooks. Produced as an edition of 3 different formats and colour ways, the subtle design techniques and high end materials will suit everyone from designers, doodlers to serial note makers. The Workshop Room presents an exciting lineup of hands-on sessions for visitors to take part in. On Saturday join London Terrariums and Studio CUSTHOM for a one off collaborative Tinyjohn terrarium workshop. On Sunday take part in Milkwood’s candle making session, be guided through making your bespoke scent blend and hand pouring your own candle to take home. Finishing off the programme, Collage Club swaps pencils for scissors and a wealth of beautiful papers in their fun and creative collage workshop. For times and to book your place click here. Visual artist Chrissie Nicholls will be leading a walking workshop encouraging people to look-up, take notice and appreciate the detail in the neighbourhood as she leads people through the streets of Deptford taking in the sites on her ‘Mapping Deptford’ walking tour. You don’t need to be be able to draw, you only need to be curious! Each person will make a unique-to-you Turkish-fold map book. Book your place here. £15 per person. The hugely popular Makers Market will return again, this year housed on the Carriage Ramp in Deptford Market Yard. A carefully chosen collection of some brilliant local designer-makers will be exhibiting and selling their work. You will be able to see a range of disciplines from ceramics, jewellery, textiles, art and fashion. New names joining some of our regular exhibitors include In The Making Apron, Olivia J Holland and Roebuck Press who will be joining clothing brand favourite, Fronté and lighting designer Tim Walker Studio amongst others. Click here to view the full list of makers. Furniture designer and maker, Sebastian Cox, presents his new collection Pendean exclusively with South East Makers Club. Designed as a beautifully simple and highly functional collection, Pendean comprises a series of workaday pieces including a dining table, bench, bookcase, settle and blanket box made in English ash. Cecily Vessey is an illustrator specialising in line drawn landscape and landmark-filled skylines and intricate street scenes. For South East Makers Club she is transforming the huge glass window front of The Taproom in Deptford Market Yard with bespoke artwork showing four individual scenes from around Deptford. Cecily's work is stocked in The Natural History Museum, Design Museum, Houses of Parliament, Tate Modern and The Shard and we are very lucky to have her work on show. Go and take a look…and sample The Taproom SE8’s sourdough pizza and local brews. The infamous Designer Pub Quiz returns for a third year, in a new location with a new host as tradition dictates. Previous quiz masters have included Tom O’Dell and Jay Osgerby and this time Sebastian Cox and Brogan Cox are taking to the mic. Each question is submitted by different designers, makers, industry experts and journalists and and there’s even a maker’s round (usually) involving modelling clay and pipe cleaners. Local cafe & restaurant Festa sul Prato will be hosting a Supper Club on Friday 14th September. The aim of the dinner will be to showcase local designers, introducing tableware in combination with a menu; plates, cutlery, napkins, tray, candlesticks all made locally will be used to serve the dinner on and there will be an informal PechaKucha between each course with the designers and makers. Down the road in New Cross, CUSTHOM have collaborated with London Terrariums within their shop, drawn together through a shared appreciation of each others work. Collectively highlighting all that is simple and beautifully curated through the eyes of both studios, you will enter a bold immersive space, filled with hidden detail. On Saturday join London Terrariums and CUSTHOM for a one off collaborative Tinyjohn terrarium workshop at the Workshop Room in Deptford Market Yard. Find out more here. 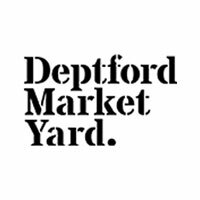 This year's Makers Club is focussed around Deptford Market Yard.